Grammy nominated and multi-platinum G.O.O.D. 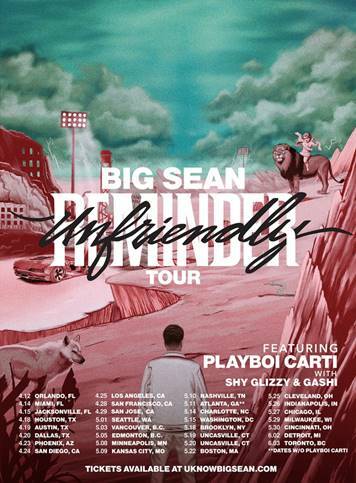 Music / Def Jam Recordings artist, Big Sean, announced today his North American headlining “Unfriendly Reminder Tour”, which is set to kick off April 12th in Orlando, FL. The multi-city trek produced by Live Nation will hit a number of major U.S. cities including Miami, Houston, Los Angeles, Atlanta, New York and Detroit. The outing will feature direct support from acclaimed rapper Playboi Carti, along with opening sets from Shy Glizzy and GASHI. Big Sean will perform fan favorites spanning his entire discography, going beyond a normal album tour. The 31-city tour is scheduled to wrap June 3rd in Toronto, Canada. See full routing of concert dates and venues below. The “Unfriendly Reminder Tour” will be a celebration of Big Sean’s decade long career signed to G.O.O.D. Music and pay tribute to his fans. Each fan will be able to vote and choose their top 20 songs for their respective cities and help curate the set list from his entire discography. Voting will be available starting on Thursday, February 8th only at uknowbigsean.com. All stops will have brand new tour merchandise available and in select cities fans will have the option to customize handpicked pieces. Live Nation pre-sale tickets will be available on Thursday, February 8th between 10AM-10PM local time. Tickets will go on sale to the general public on Friday, February 9th at 10AM local time at LiveNation.com.